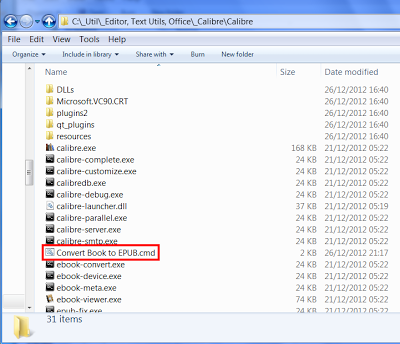 One year ago I developed a simple script to convert any document (PDF, RTF, TXT,...) to EPUB format, using Calibre. So I implemented these features in an updated version of the script. Click here to Download the new version of the script. Check the original article for more information about this script, and how to use it. If the epub file already exist, now the script will add current date/time to the filename. Example: you try to convert a file named "Asimov - Nightfall.pdf", the script try to create a file named "Asimov - Nightfall.epub", but if this file already exist the script will then create a file named "Asimov - Nightfall 01_01_2014 21.13.52,34.epub" by adding current date/time to the filename. This updated script, in theory, can convert up to 400 files at once. The real limitation came from Windows max command line length, that is limited to 8191characters. So, in real life, you probably won't be able to drag and drop 400 files on the script, because their full pathname will be longer than 8191 characters. 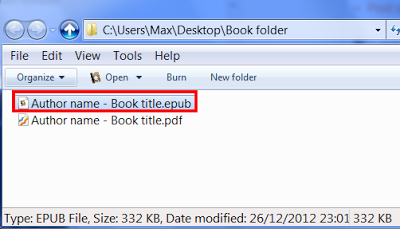 By "Full pathname" i mean the full path + filename of the files, so a full pathname of a file my look something like "E:\eBook\asimov books\series\Asimov - Empire 1.pdf" whick is long 52 chars. So if you have files like that, you can convert a maximum of about 8192 / 52 = 157 files at once. 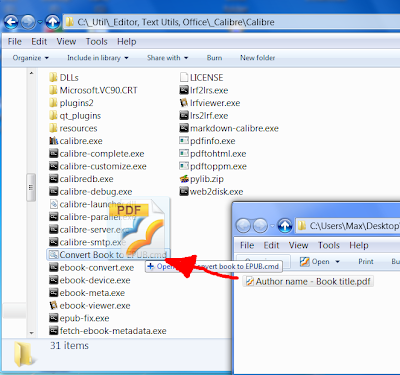 Depending on you filename and folder structure your mileage may vary. 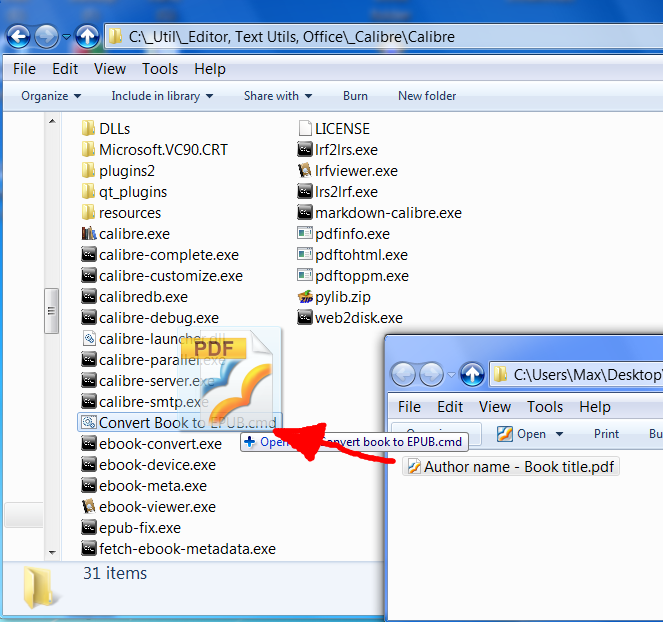 Here is a color-coded version of the EPUB conversion script, the same script you can download here. "%scriptPath%\ebook-convert.exe" "%~1" "%outputFileName%" %InputfileParameters% %PDFInputfileParameters% %EpubInternalHTMLsplitSize% --authors "%autore%" --title "%titolo%"
This batch file is very similar to the old one. 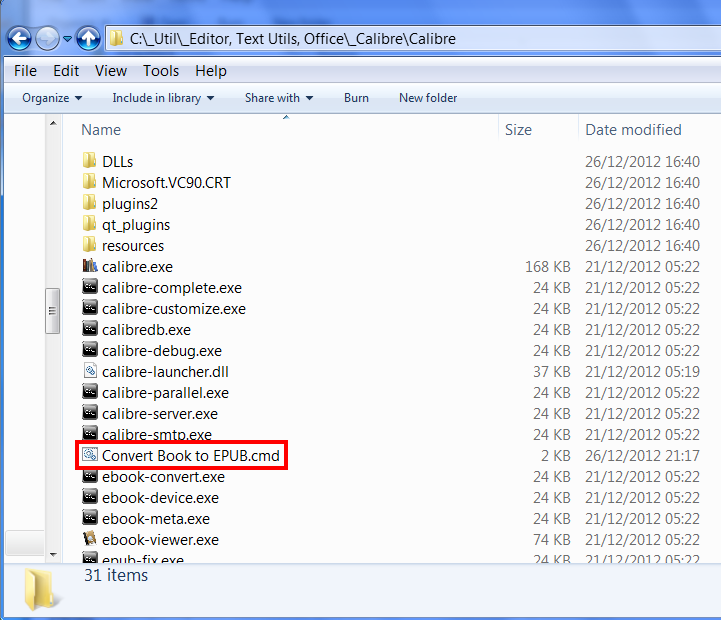 All the main code to do the conversion is included in a Sub function called epubConvert.